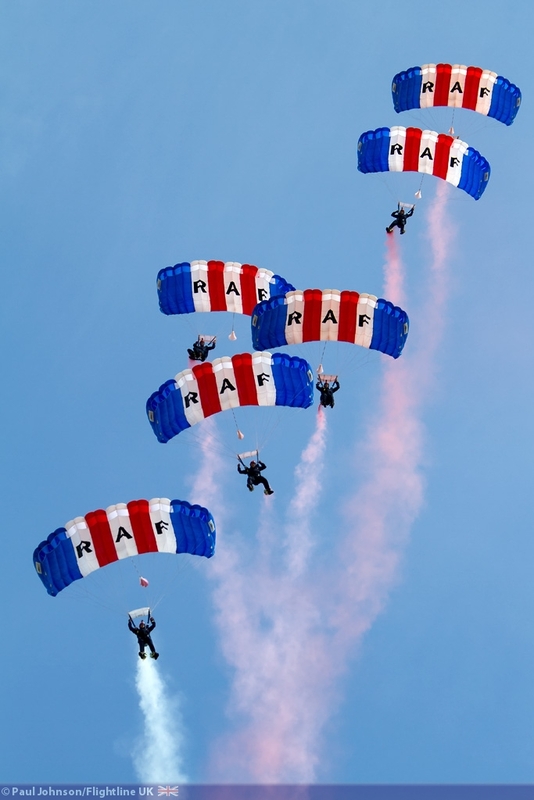 The RAF Cosford Airshow is the first major military airshow of the year and this year celebrated some important anniversaries. 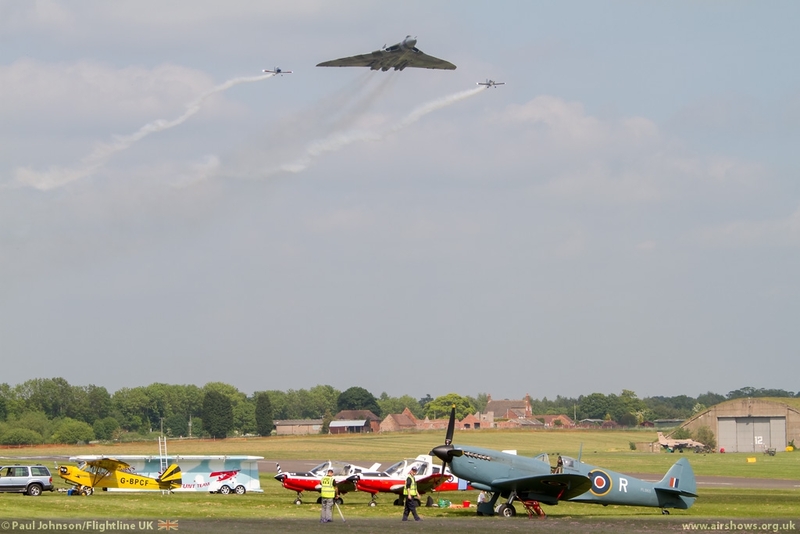 RAF Cosford itself was celebrating its own 75th Anniversary while the show also marked the 40th Anniversary of the Jaguar entering service and the 75th Anniversary of the Spitfire's service entry. All this was set against one of the most varied flying displays of the year with military and civilian acts out in force. 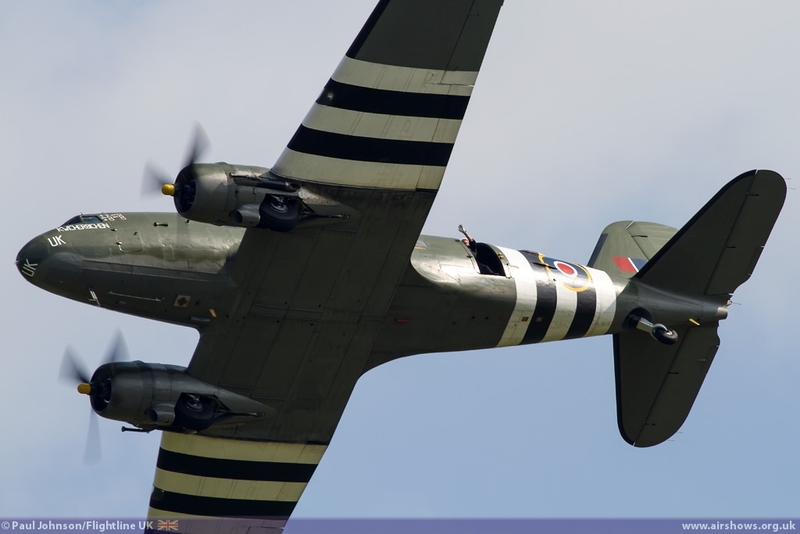 It proved to be an extraordinary day with massive crowds whicb in itself meant a fair few problems on the surrounding roads, a surprise from the Army Air Corps and a very unusual formation. 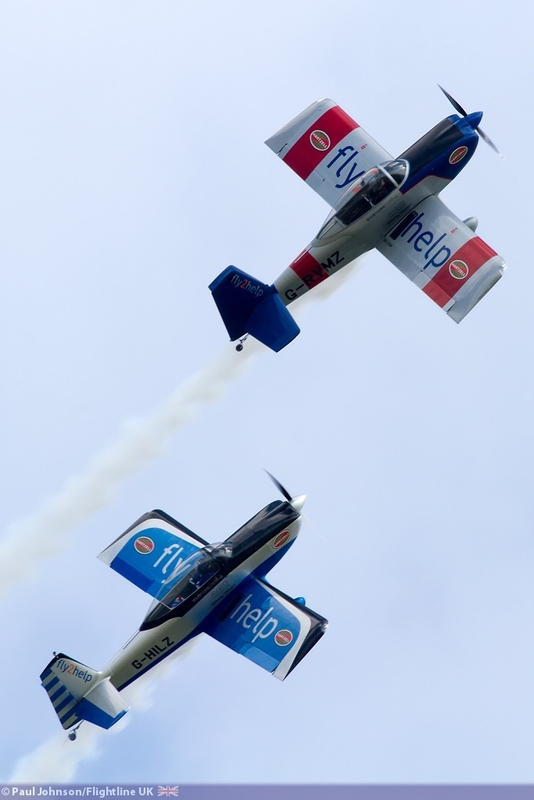 RAF Cosford is a unique venue on the circuit. 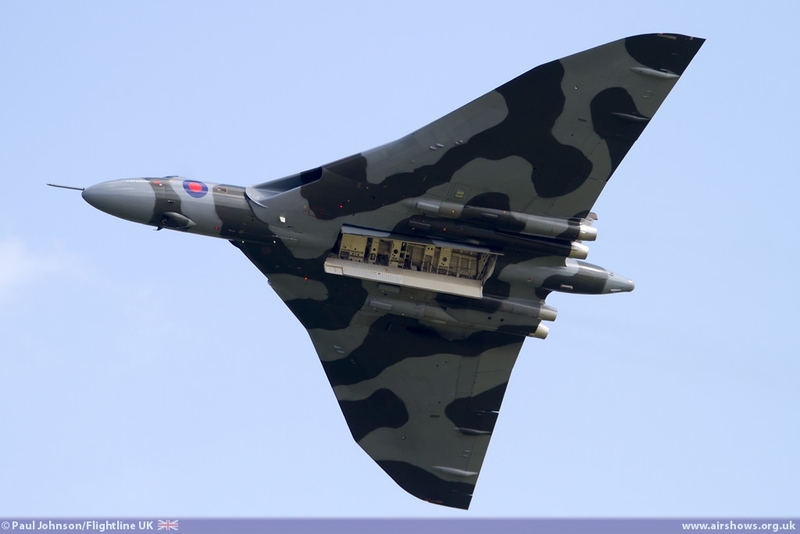 It has managed to retain much of its original infrastructure and is not a sprawling mass of concrete and tarmac like Fairford or Waddington. 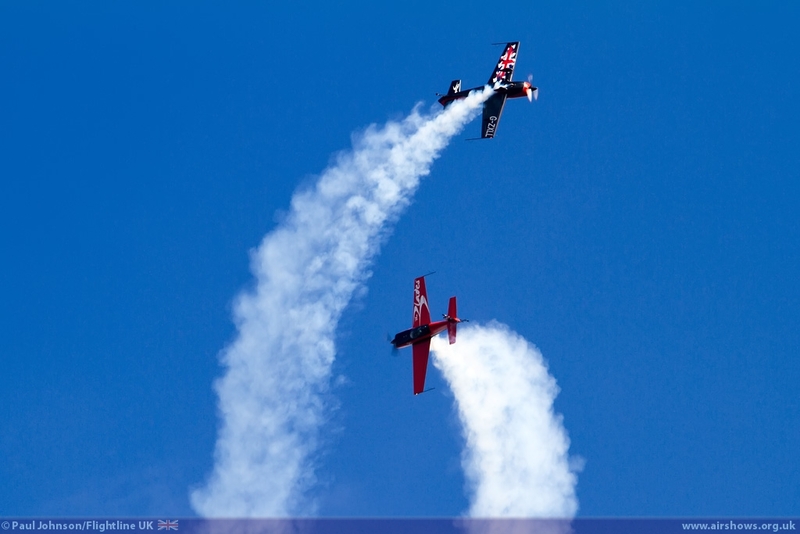 That gives the airshow a very intimate feel with all the exhibitions clustered around the main airfield hangars. 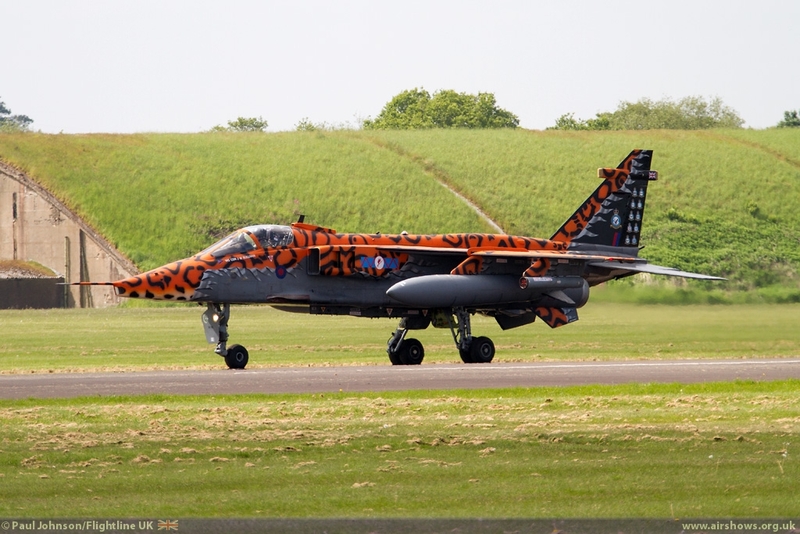 The runway is actually quite short compared to other airfields meaning many of the heavier and faster aircraft operate from nearby RAF Shawbury. 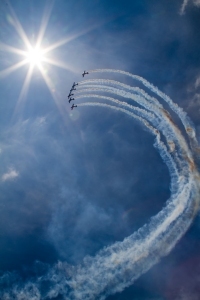 However that does not mean there is not a lot to see on the ground. 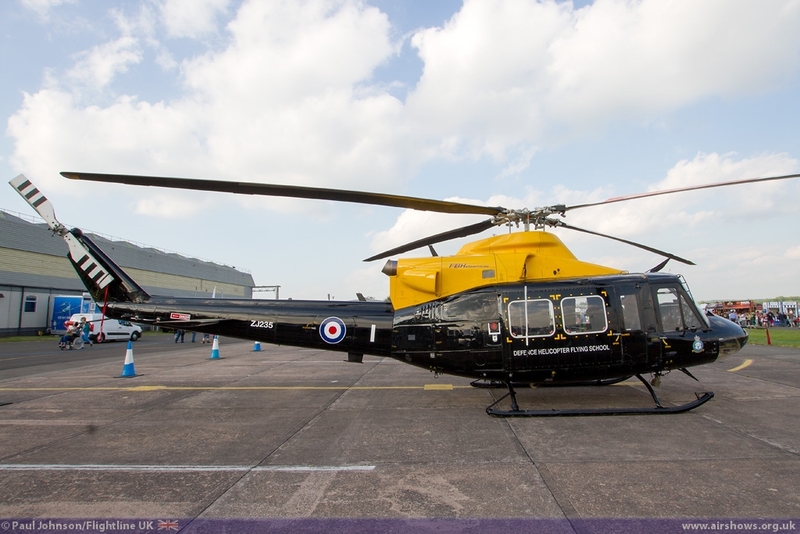 Today Cosford is an important training base for the RAF and the wider military community and the airfield is home to a number of RAF fast jets and helicopters used to train the next generation of engineers. 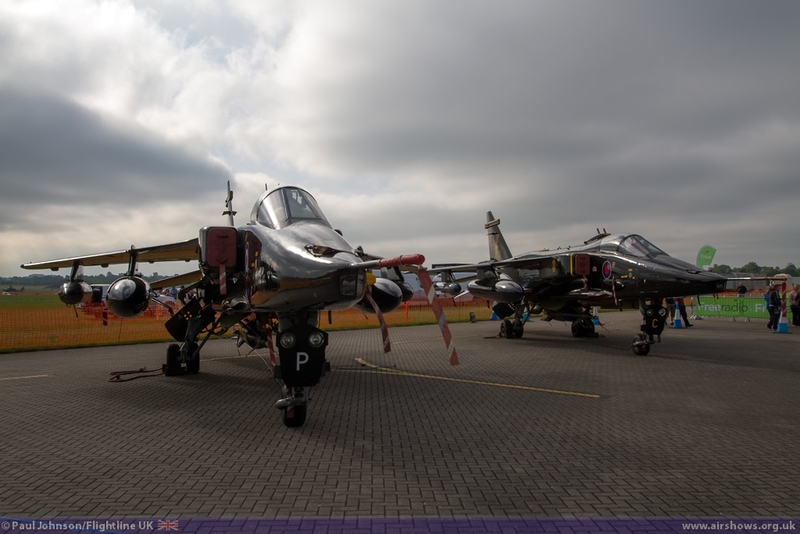 This year saw more aircraft than ever exhibited for the crowd was Panavia Tornado GR1s, a BAe Harrier GR3 displayed in its hide, SEPECAT Jaguars, Westland Gazelles, Westland Sea Kings and BAC Jet Provosts all on show and many with open cockpits. 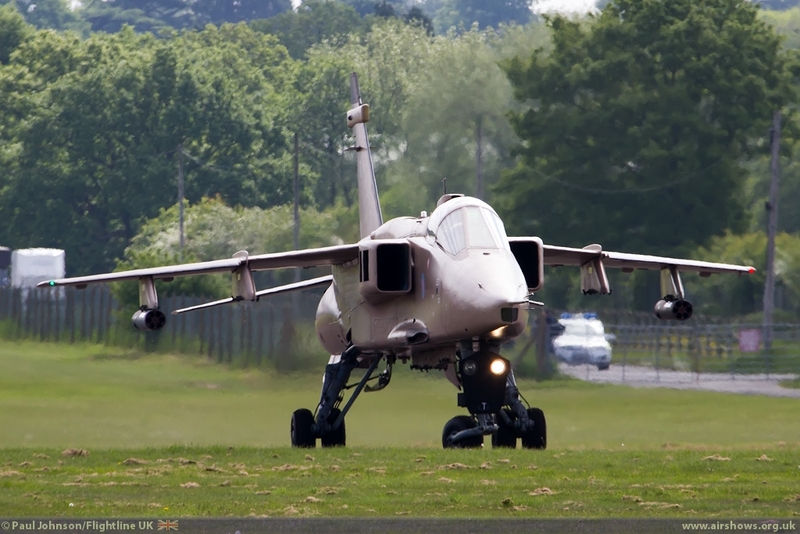 The Jaguar in particular is an important aircraft for Cosford, and further to the static displays two Jaguar GR3 opening the show with a taxying demonstration on the main runway. 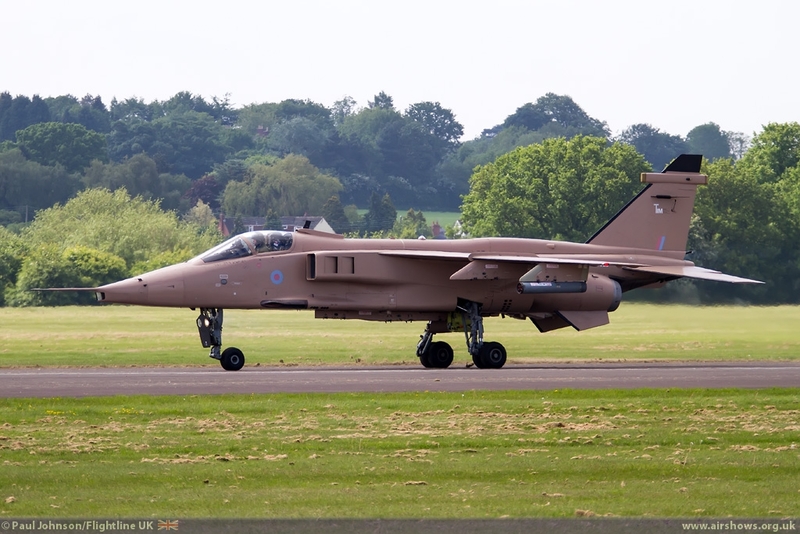 2013 marks the 40th Anniversary of the SEPECAT Jaguar entering service with the RAF. 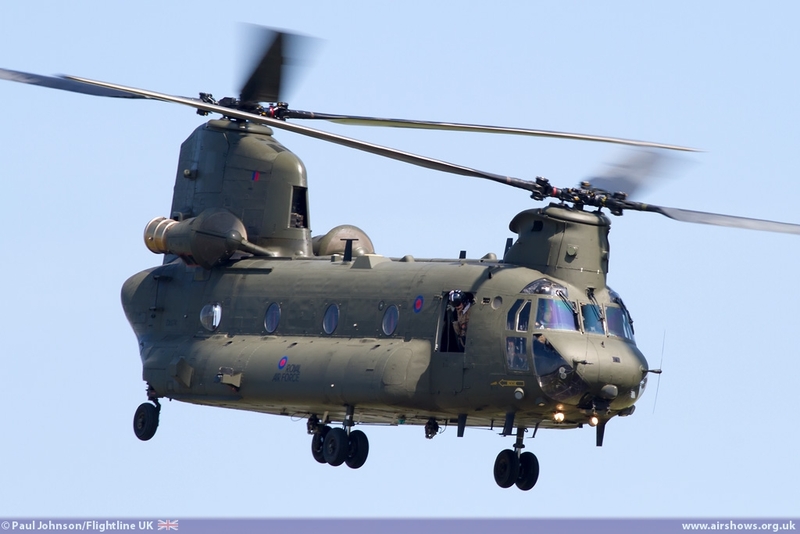 It is a type held in high regard for its sterling service on the frontline including in operations over Iraq and the Former Yugoslavia. 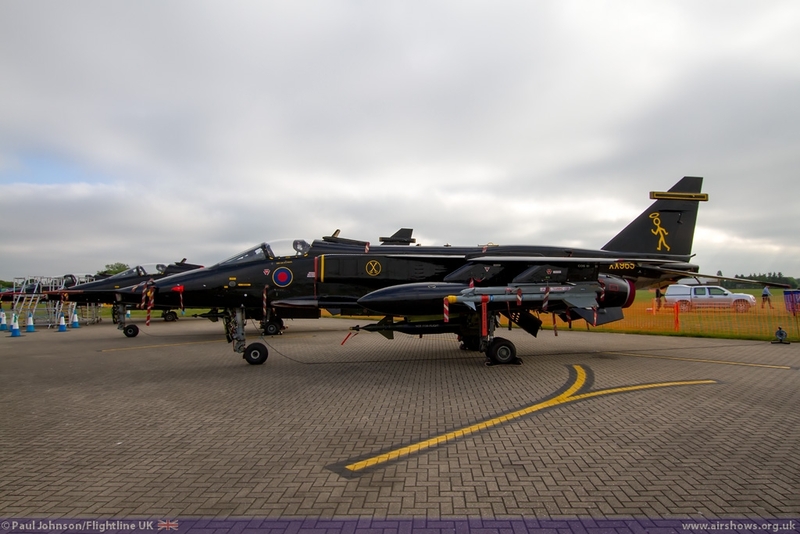 40 years on, it still provide valuable service to the Royal Air Force providing trainee engineers and groundcrew valuable real-life experience of maintaining and operating complex combat aircraft. 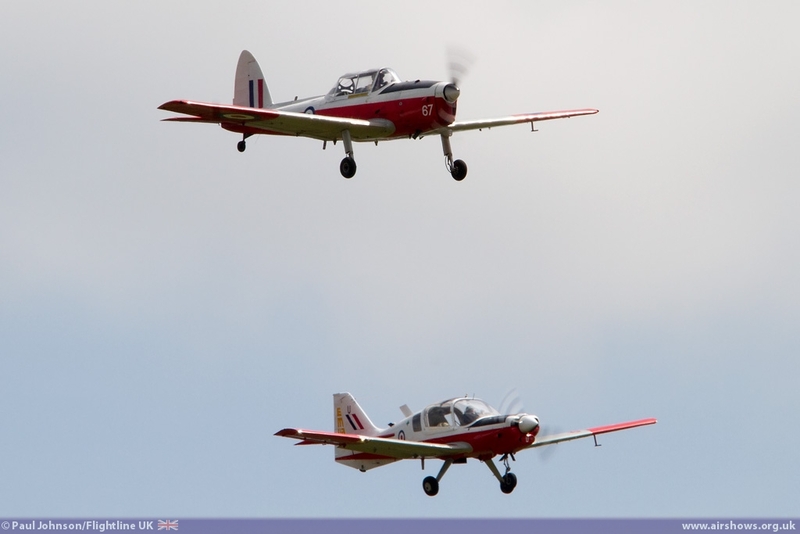 The flying displayed was opened with another look at Cosford's role in training with displays from Howard Cook in the De Havilland Chipmunk T10 and Rod Dean in the Bulldog T1. 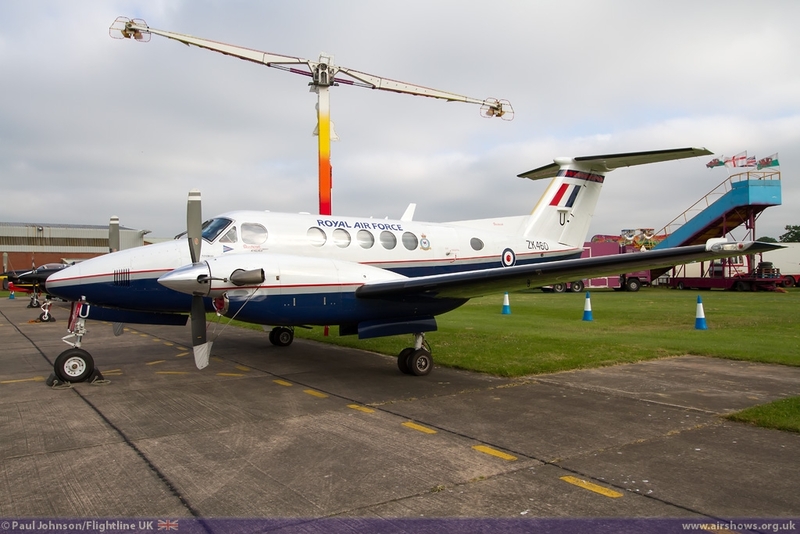 Cosford has long been home to the University of Birmingham Air Squadron or UBAS for short. 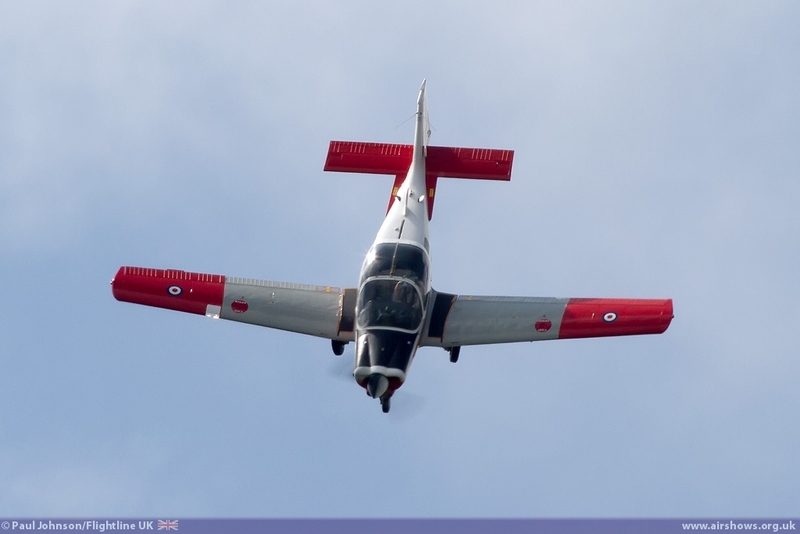 Today the squadron operates the Grob Tutor T1, but in the past has operated both these important RAF Training aircraft. 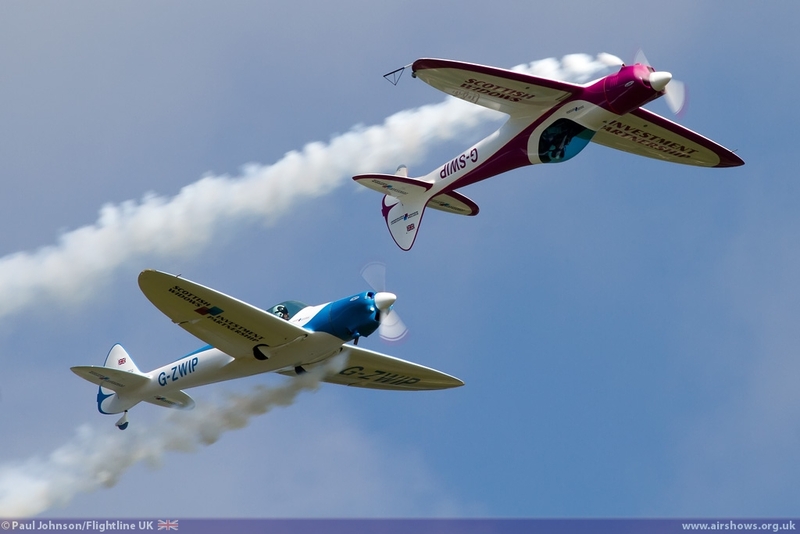 After spirited aerobatic sequences, Howard and Rod formed up for a series of 'station flypasts' to complete their display. Naturally the Royal Air Force was out in force for what had become the first major weekend of public displays for the various display teams. The Red Arrows were of course a major highlight for the massive crowd of well over 50,000 enjoying some wondering summer weather. 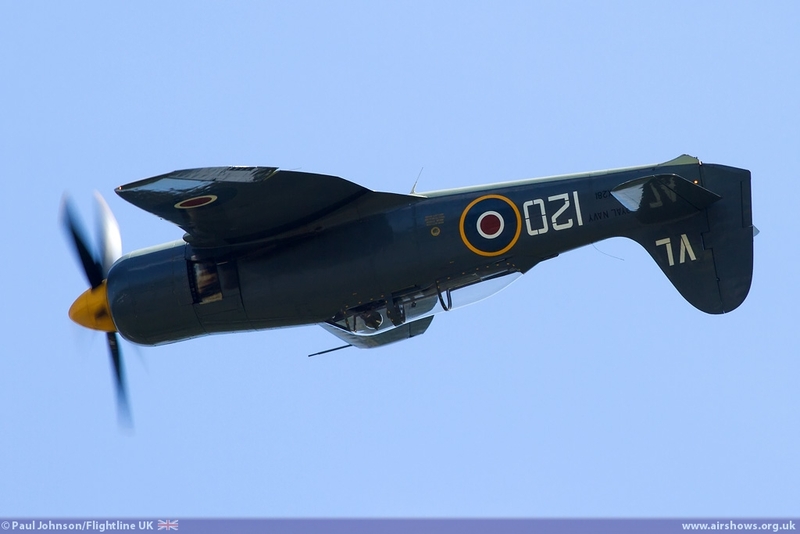 They were joined by the Falcons Parachute Display Team and the Battle of Britain Memorial Flight; the latter with a full complement of Lancaster, Spitfire PRXIX, Hurricane IIc and Dakota III. 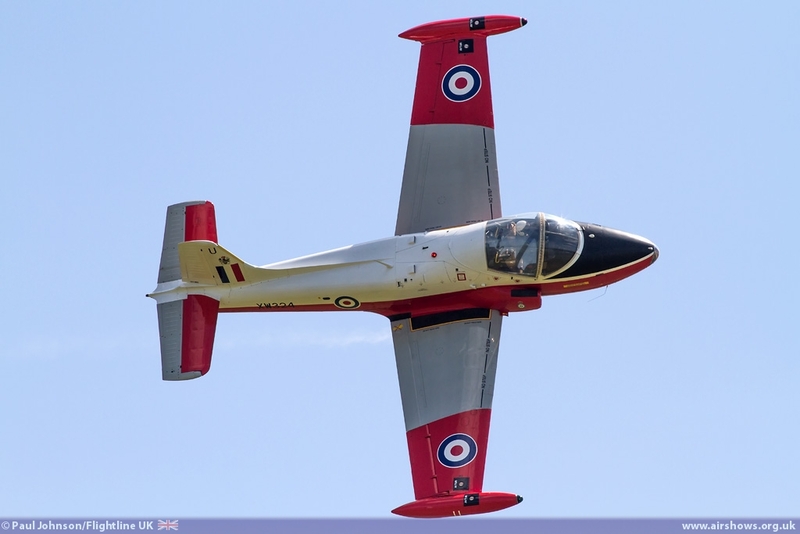 Cosford marked an unusually late start for the RAF solo display items. 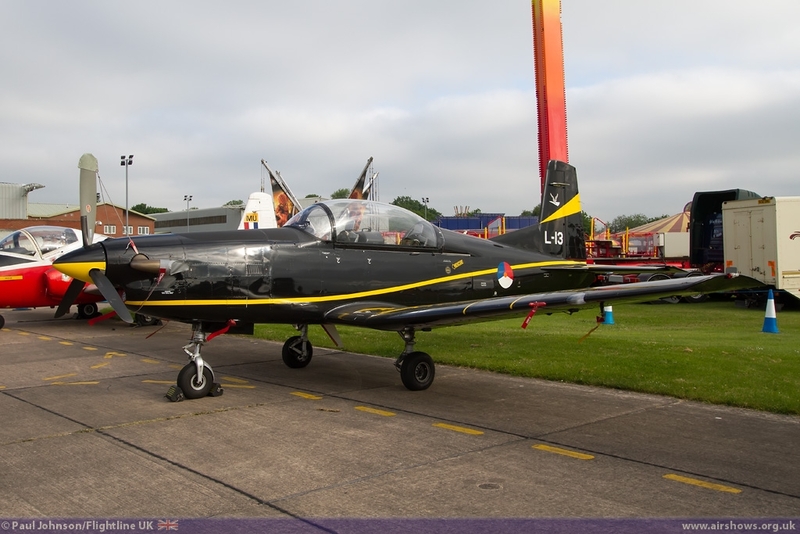 Flt Lt Andrew Fyvie-Rae gave his 2013 debut displaying the Shorts Tucano T1 from No 72(R) Squadron based at RAF Linton-on-Ouse. 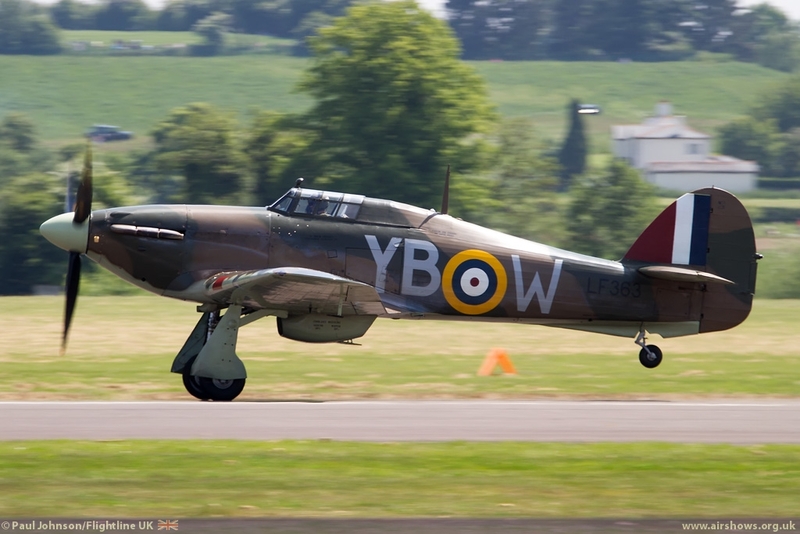 For the 2013 season, No 72(R) Squadron are marking 70 years since they were deployed to the North African campaign of the Second World War. 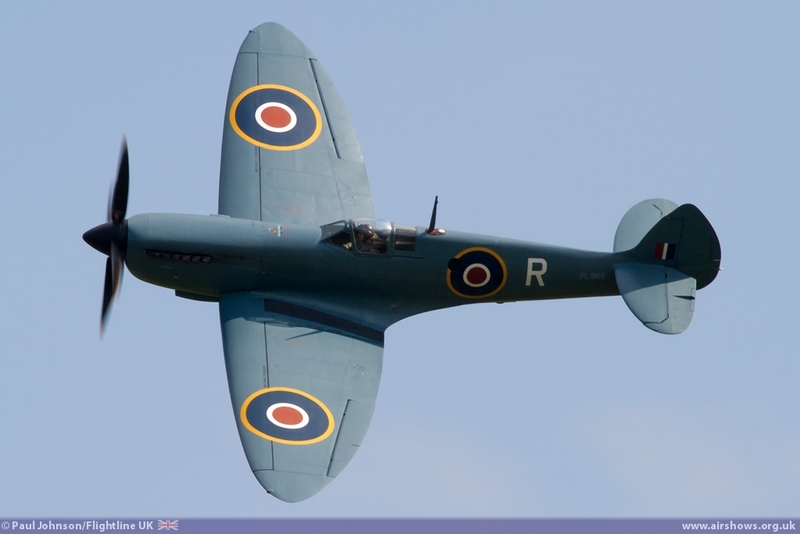 Appropriately their primary display aircraft has received the markings of a 72 Sqn Spitfire of the time, though the Squadron codes have been changed to RA-F. 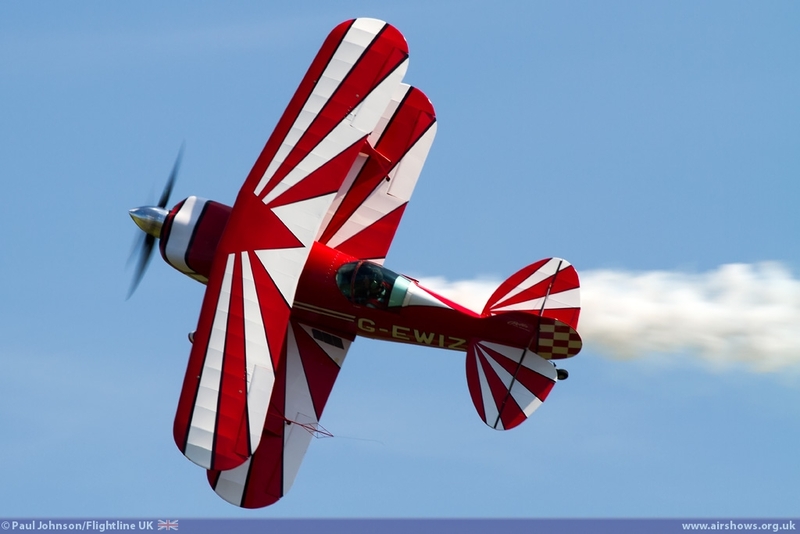 The spare aircraft also sports a special scheme with the RAFA Wings to mark that association's 70th Anniversary. 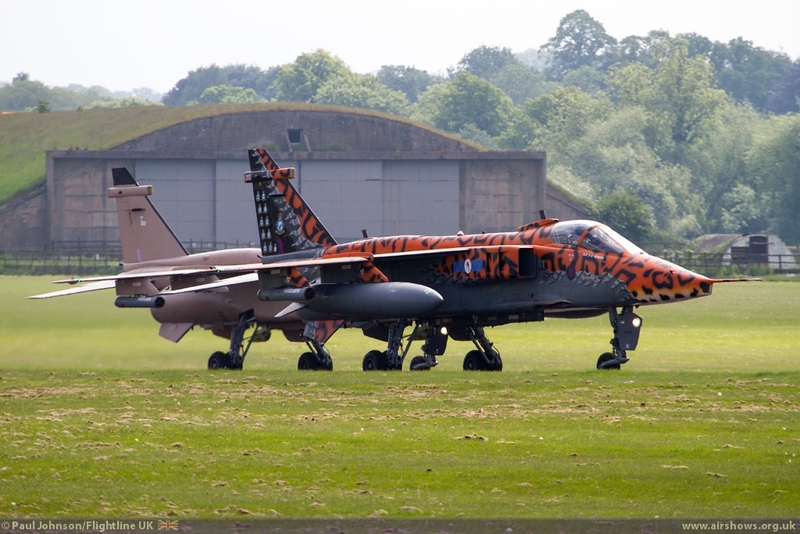 Alongside the Tucano was the Typhoon FGR4. 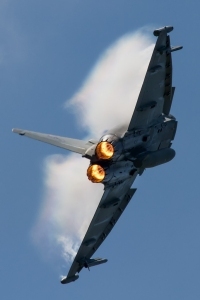 No 29[R] Squadron have returned to provide the solo Typhoon display from 6[F] Squadron with Flt Lt Jamie Norris in the hot seat. 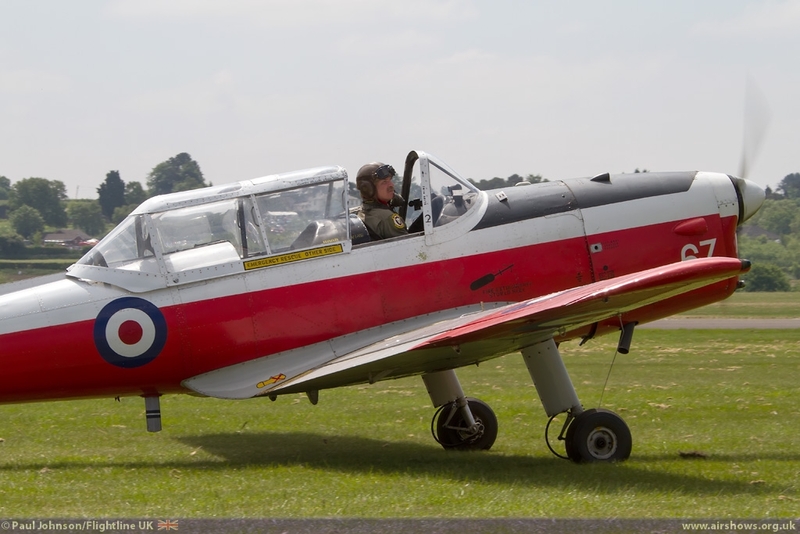 Jamie has had an interesting start to the season gaining his PDA very early in March to allow his to take part in the Malaysian trade airshow LIMA held in early April. 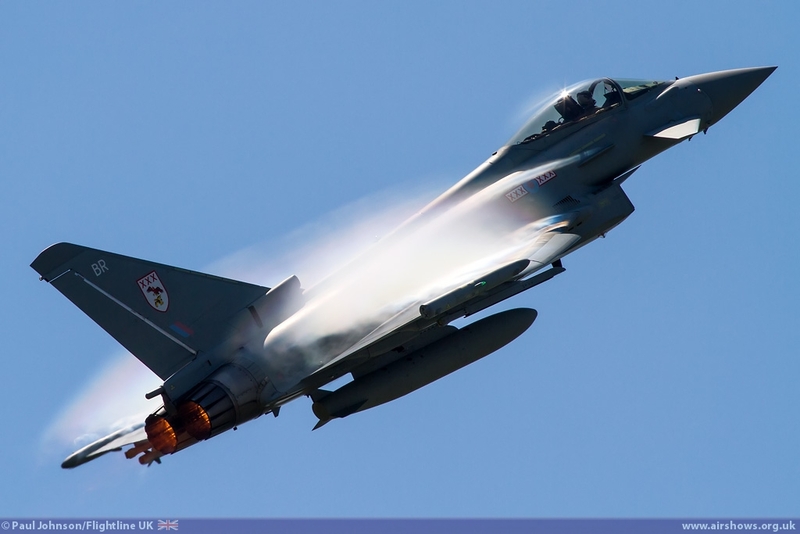 After a display at the Shawbury Landowners Day at the end of May, The Cosford weekend marked the first full weekend of public displays for the Typhoon with appearances at Throckmorton, Welshpool and Cosford. 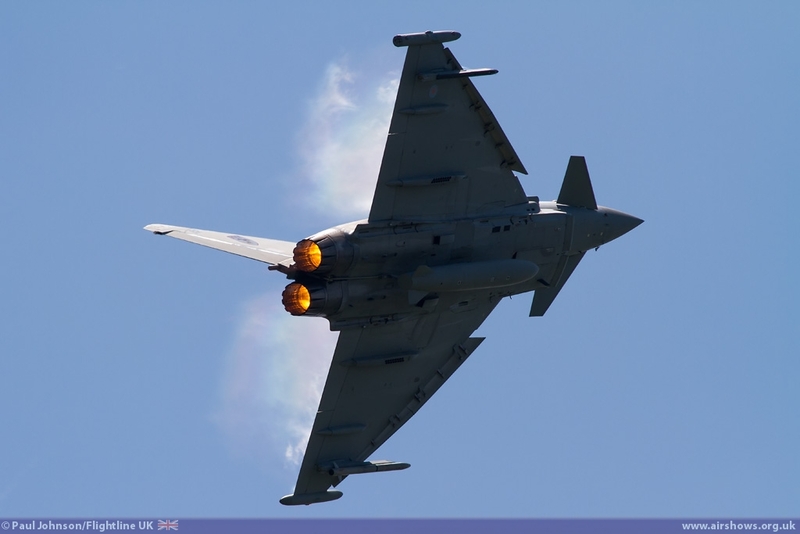 Jamie shows off the Typhoon amazing performance very well in his routine which contains several new twists. 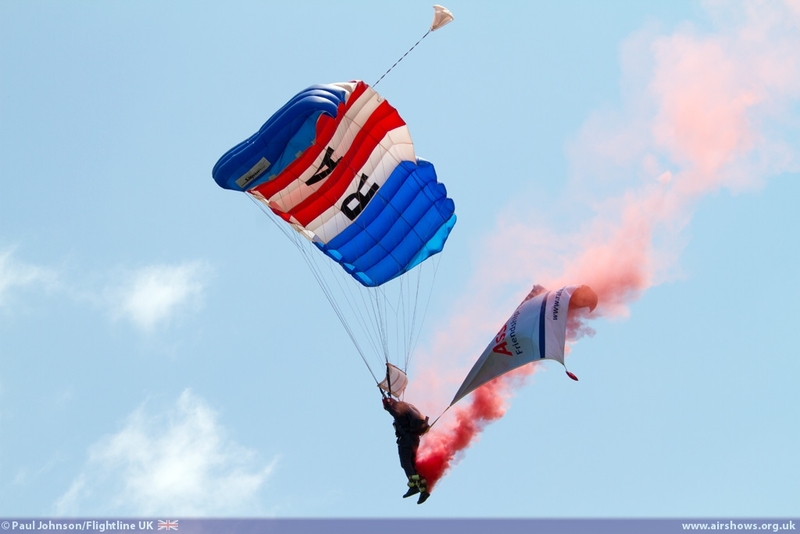 It was great to see the military displays performing something different at Cosford. 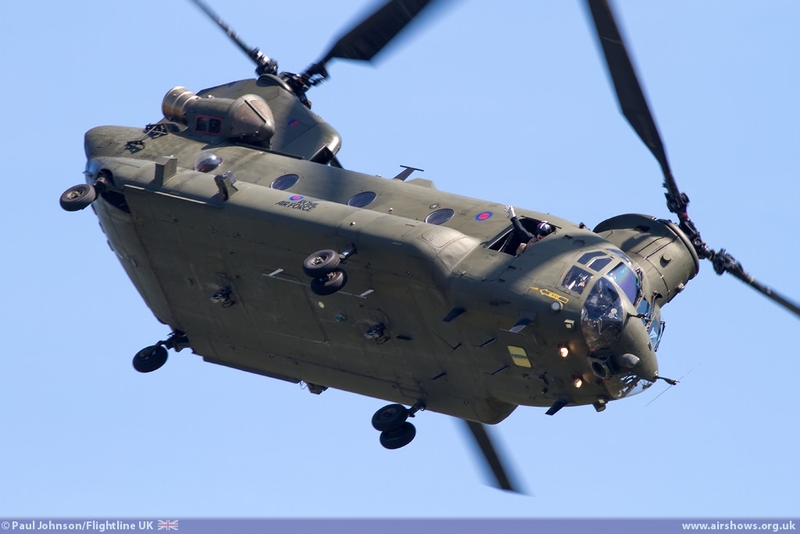 The Boeing Chinook HC2 solo display was also making its 2013 debut at the show performing everything we've come to expect from the highly agile heavy-lift helicopter. 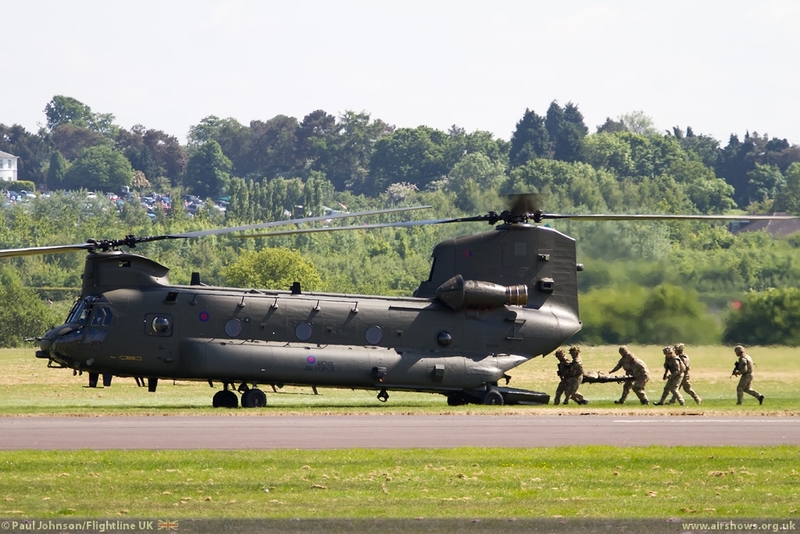 However the flying display also saw the Chinook perform a role demonstration alongside the Army Air Corps WAH-64D Apache AH1 highlighting the important roles Medical Emergency Response Teams (MERT) have played during operations in Afghanistan. 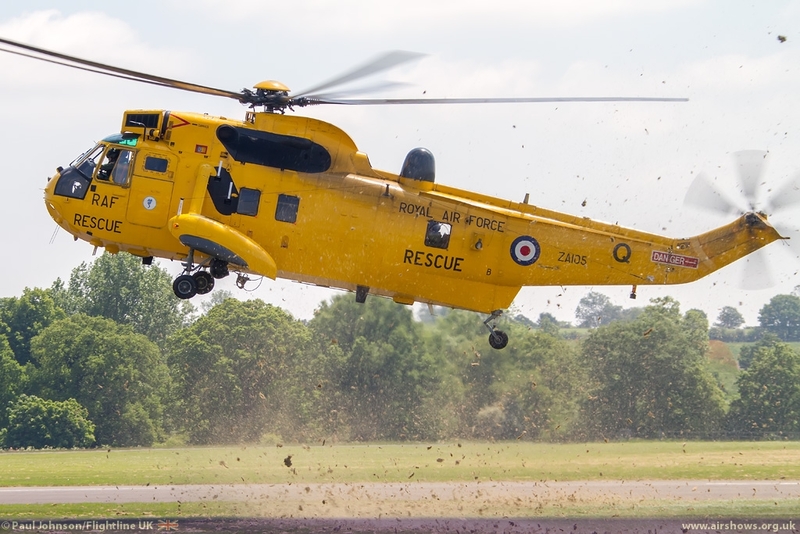 It was a particularly appropriate place to hold such a demo as RAF Regiment gunners based at RAF Cosford often deploy with MERT which themselves are based with No 4626 Royal Auxiliary Air Force Squadron based at RAF Brize Norton. 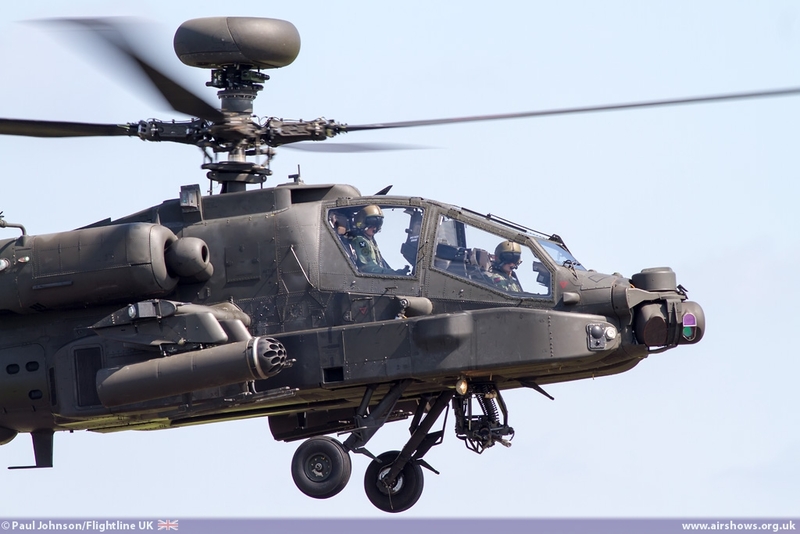 The Apache proved to be of great interest to the crowd, particularly after it became apparent that the aircraft's weapons officer was none other than Captain Harry Wales (Price Harry that is!) 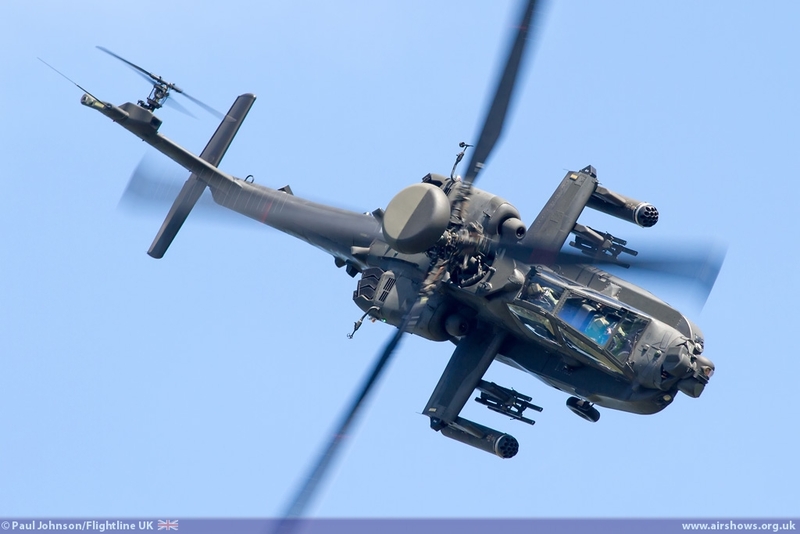 who was supporting pilot Staff Sergeant Jamie Boakes. A rare RAF participant also from RAF Brize Norton was the Lockheed Martin C-130J Hercules C5 which gave a couple of flypasts. The transport fleet as a whole is very stretched at the moment supporting operations around the world and also the great change it is currently undergoing. 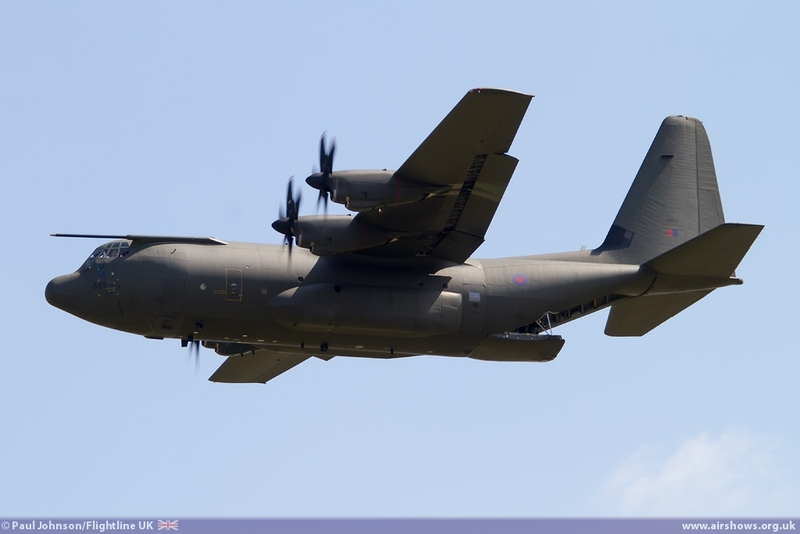 The Hercules itself has only got a few years service left as it was eventually be supplanted by the new Airbus A400M transport. 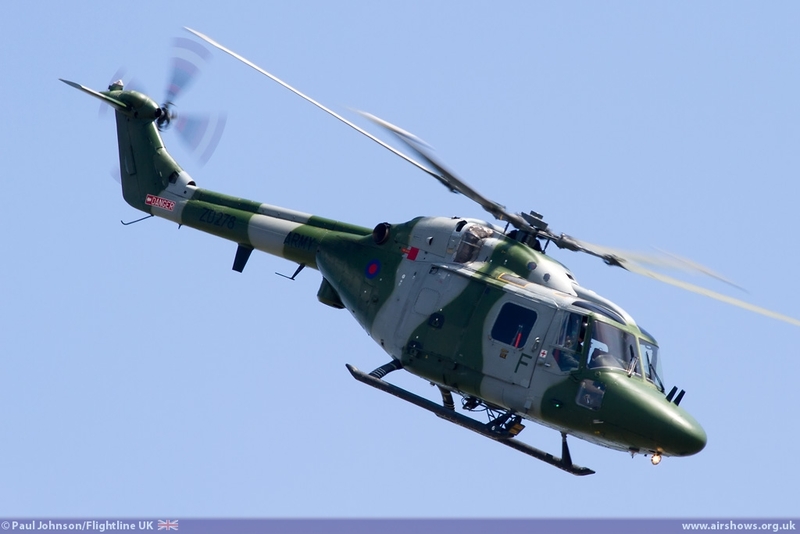 Further military helicopter displays came from the Royal Air Force Westland Sea King HAR3A from the Search and Rescue Force and the Army Air Corp Westland Lynx AH7. 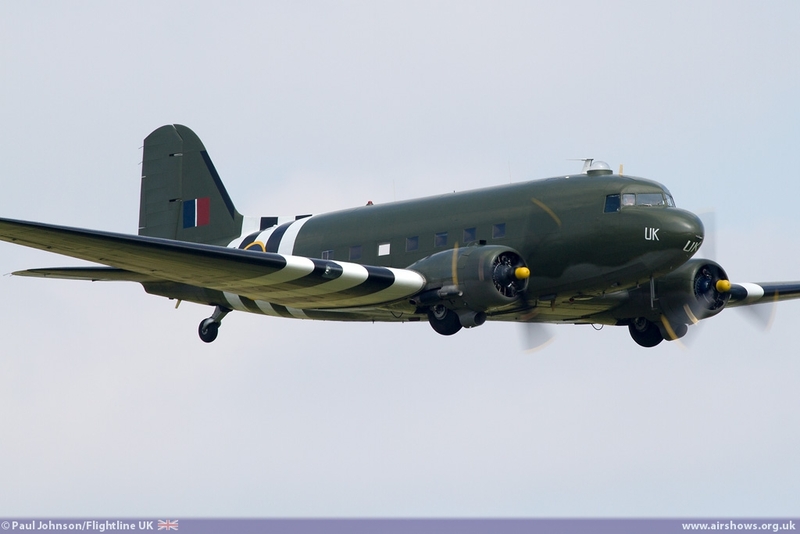 As well as the modern military hardware there was a good deal of historic aircraft in the display. 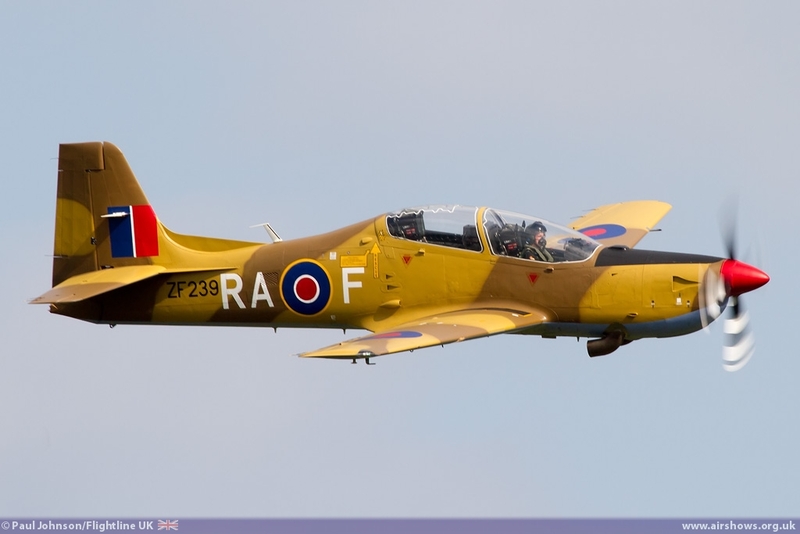 The Battle of Britain Memorial Flight Spitfire PRXIX and Peter Teichman's Spitfire PRXI flew to celebrate the 75th Anniversary of the Spitfire's service entry. 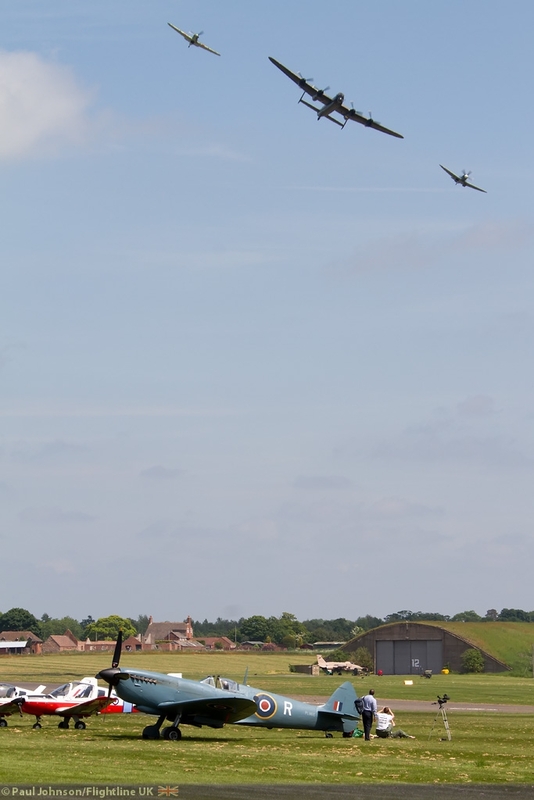 While it may have seemed a little low key compared to other Spitfire celebrations, it was very good to see both Merlin and Griffon powered Spitfire represented. 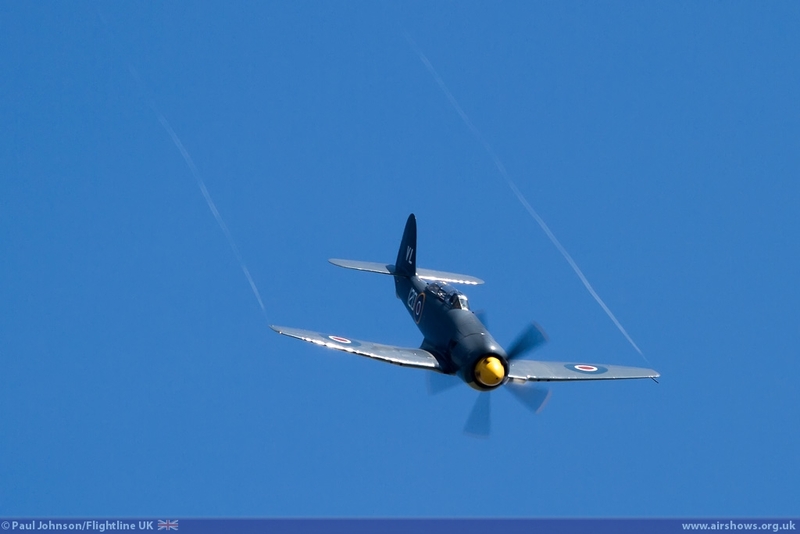 The Royal Navy was solely represented in the flying by the Royal Navy Historic Flight's Hawker Sea Fury T20 was gave typically powerful performance. 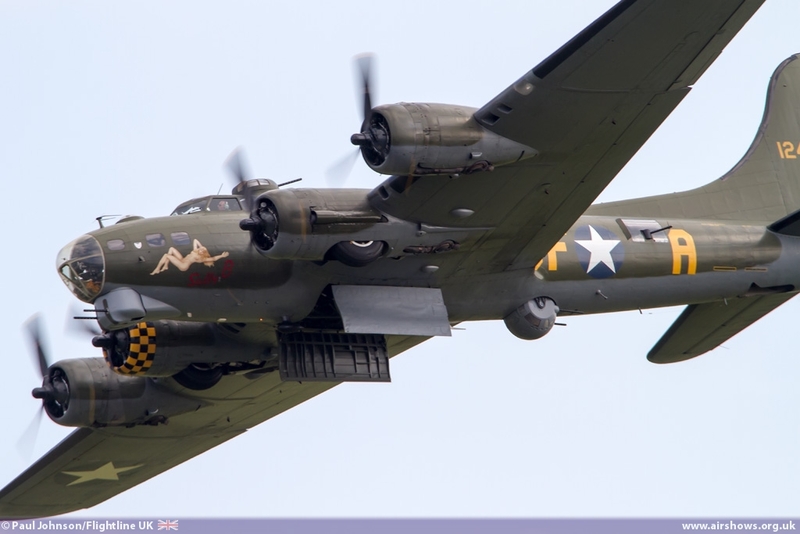 Completing the piston powered warbird line-up was Boeing B-17G Flying Fortress Sally-B which happily is enjoying a busy season which must help the supporting charity in keeping this wonderful bomber in the air. 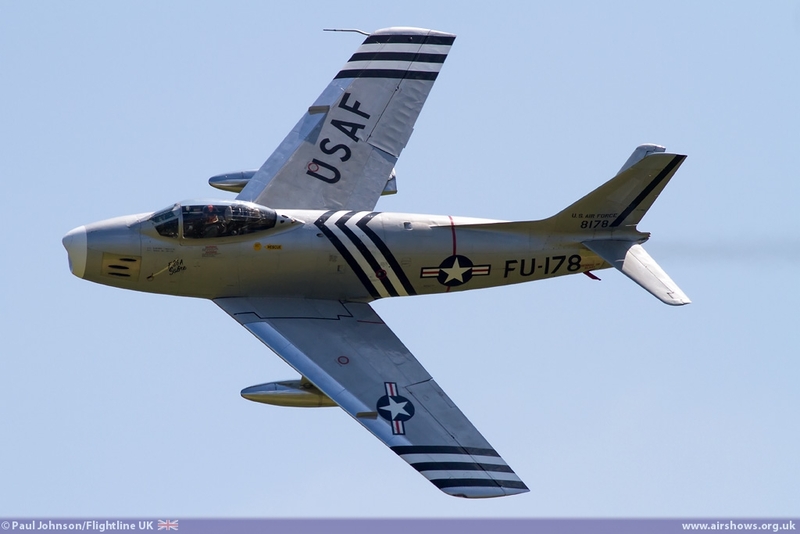 Aircraft of the Cold War was also in the spotlight. 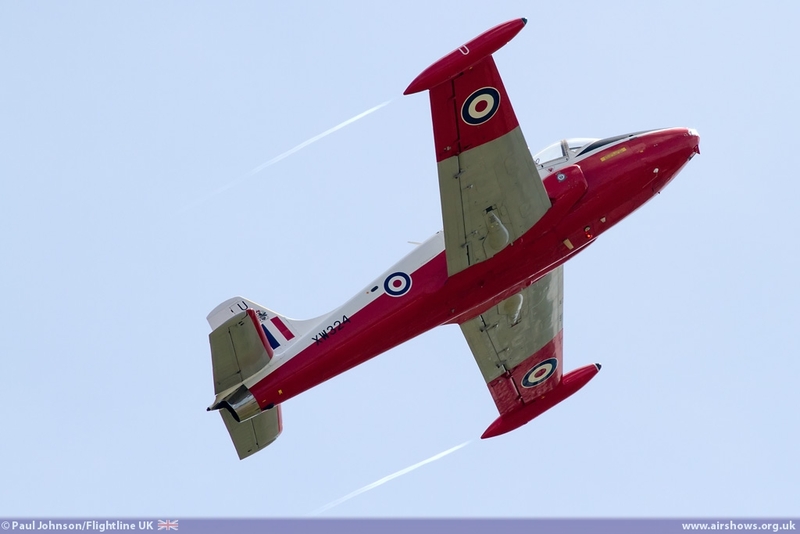 Golden Apple's wonderful North American F-86A Sabre put on typically graceful display while Dan Arlett put on a superb aerobatic demonstration in the BAC Jet Provost T5. 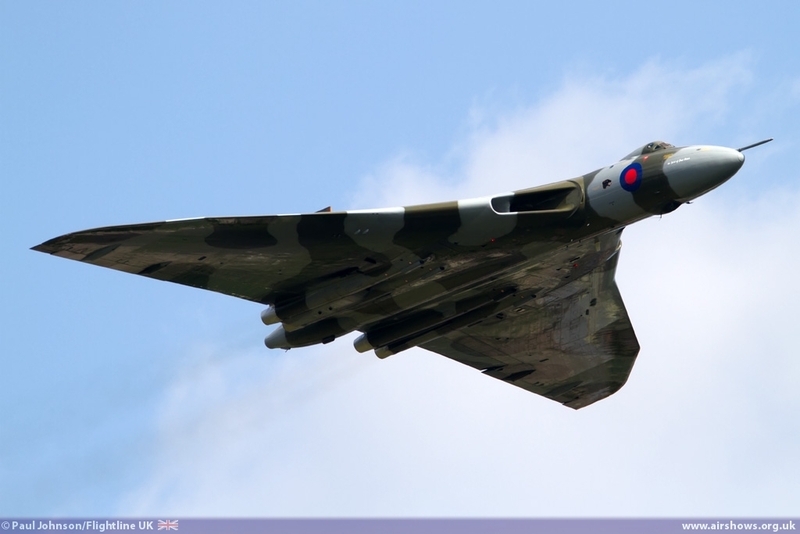 It was very good to see the Vulcan back at Cosford after a number of years absence. 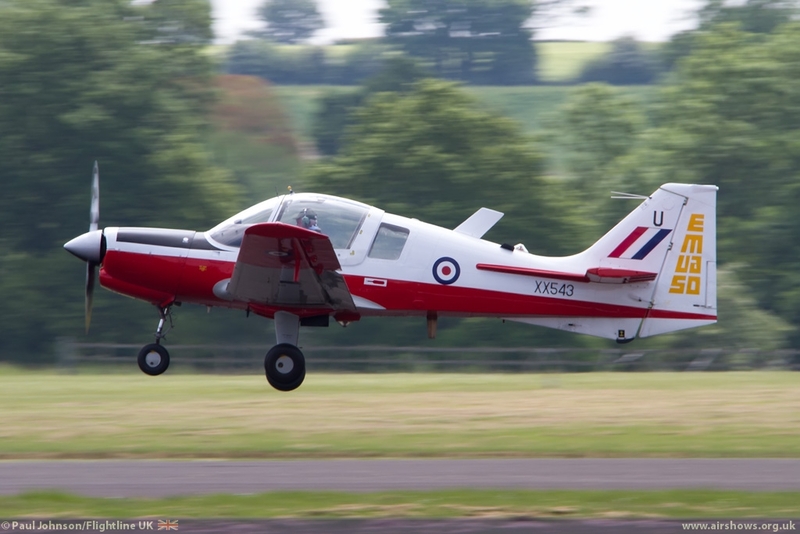 The aircraft's arrival was certainly one of the talking points of the afternoon arriving in company with the two Vans RV8s of the RV8tors formating just feet from the mighty deltas wing-tips. 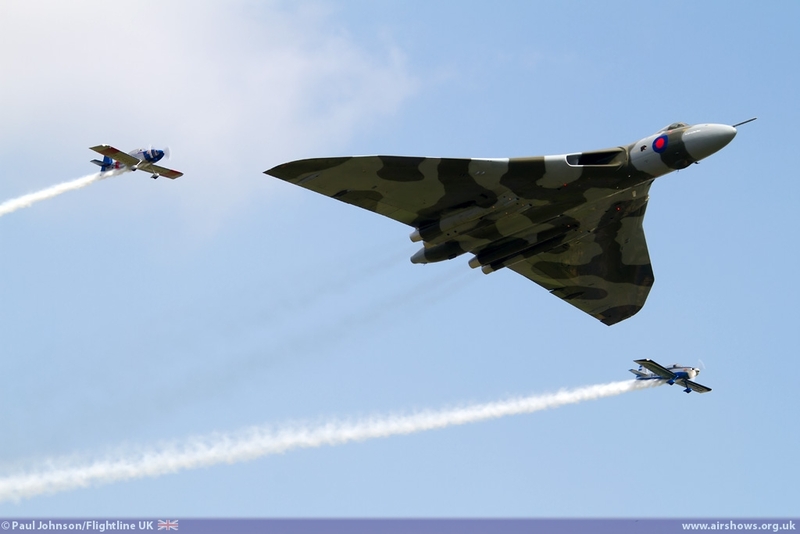 The combination made a number of passes for the crowds and cameras before the Vulcan performed it solo routine in the hands of Kev Rumens and Bill Perrins. 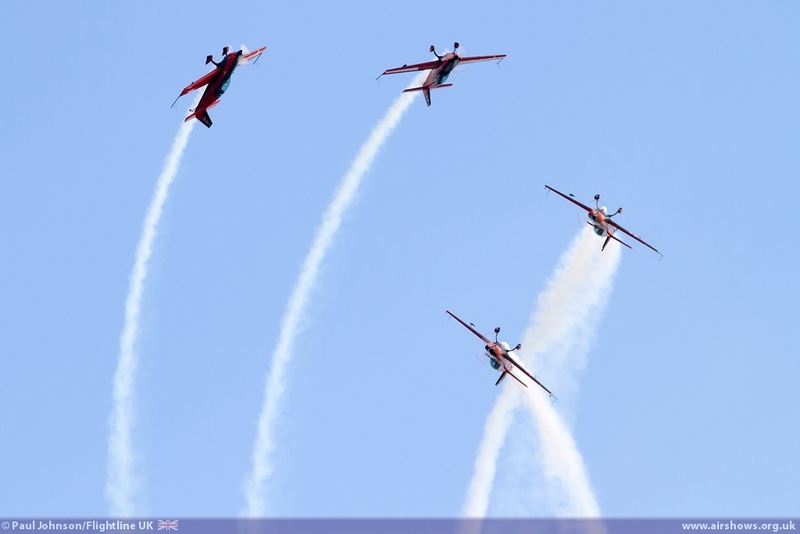 The RV8tors, who had to cut their display slightly short because of the extended time they spent alongside the Vulcan were just one of an array of the best civilian display act. 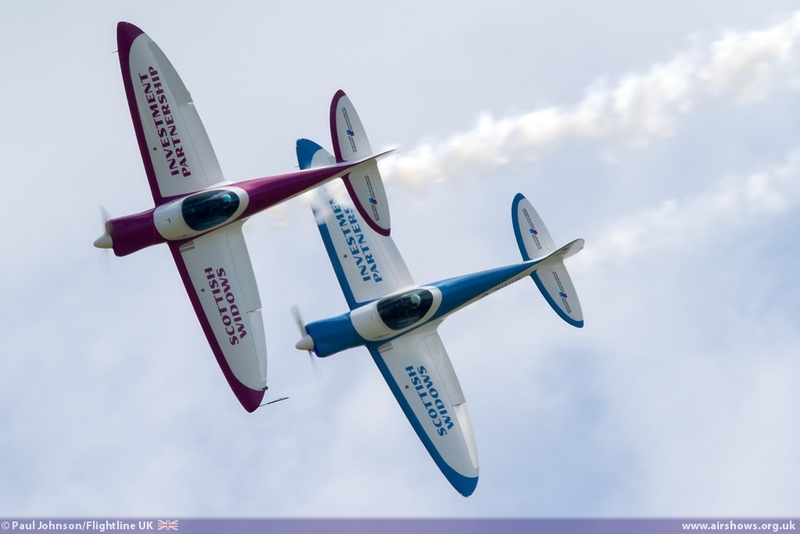 Keeping with the duo theme was the SWIP Team performing their first public duo display in the UK of 2013. 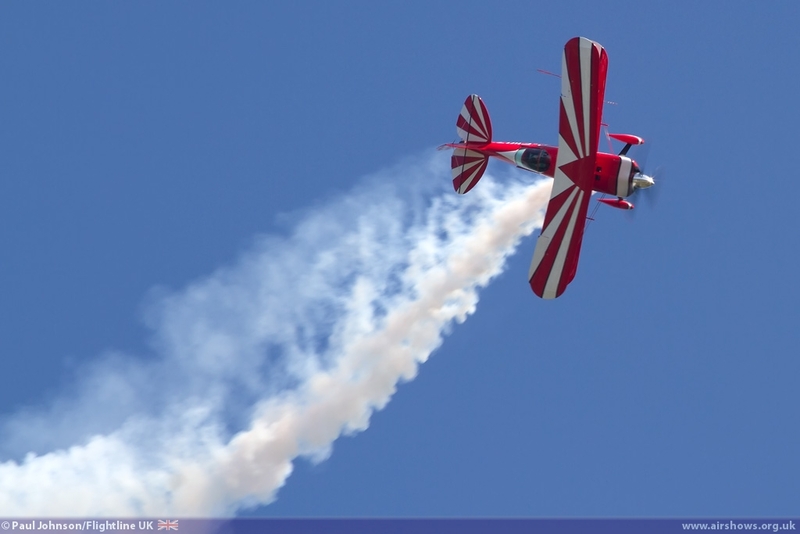 Further aerobatics came from Rich Goodwin who gave a very dramatic routine of flicks, tumbles and rolls in his newly modified Pitts S2S Special complete with smoke. 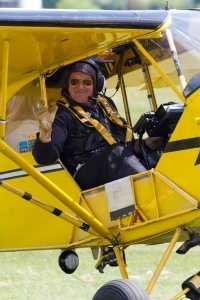 Brendan O'Brien was back in action at Cosford with his Piper J3 Cub performing his very entertaining crazy flying and truck top landing routine complete with pyrotechnics and various flashing lights. 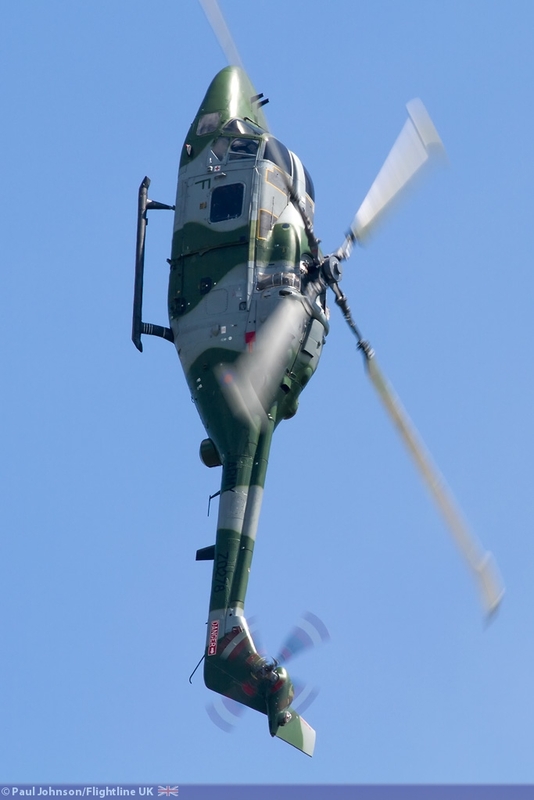 The Chinook display crew certainly got a great look at Brendan's routine at one point which contains one wheeled touch and go's, crop-sprayer pulls-ups over the trees and various steep climbs and dives. 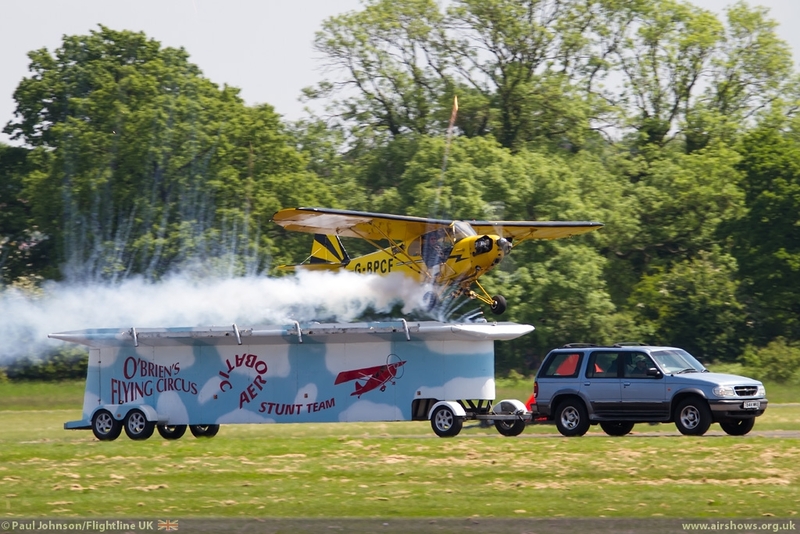 The superb weather conditions also allowed Brendan to land and take-off from his trailer to complete his act! 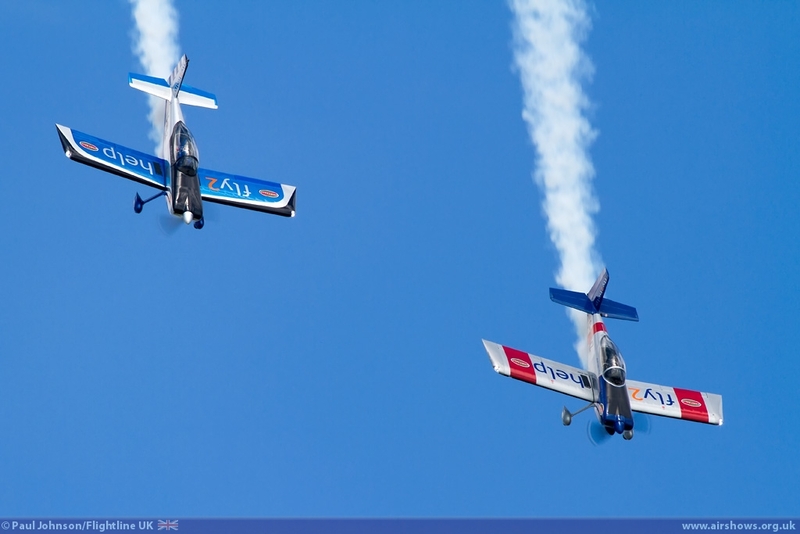 Two of the UK's best formation display teams bookended the flying display. 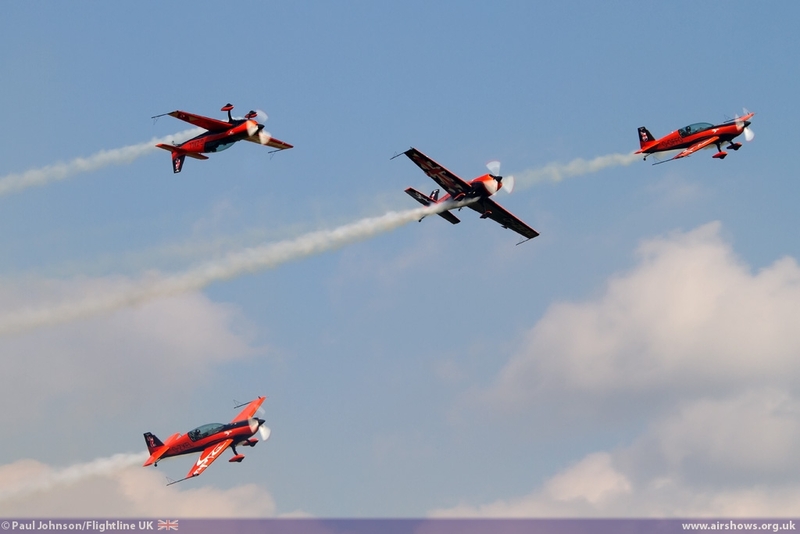 The six Yakovlev Tak-50s of the Aerostars display team appeared close to the beginning of the flying display. 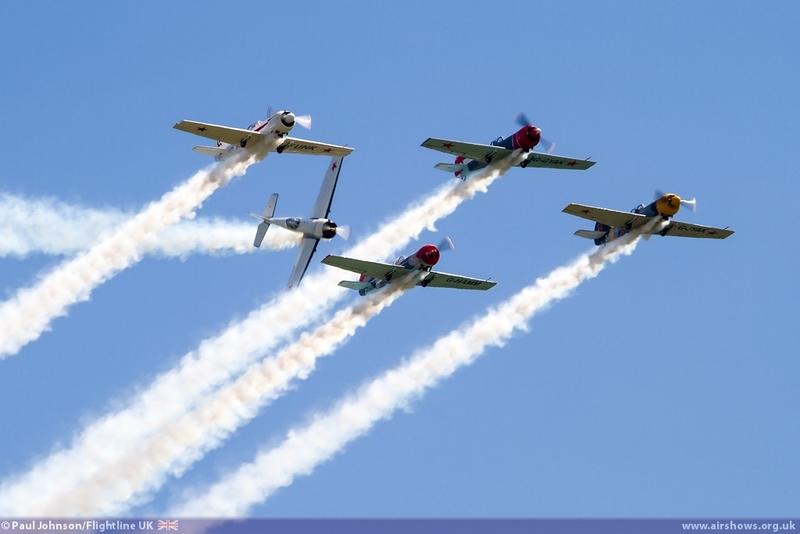 Their superb display is always a highlight of the show as the Yak is such a capable aerobatic aircraft and has great presence. Closing the day were The Blades who were debuting their latest branding. 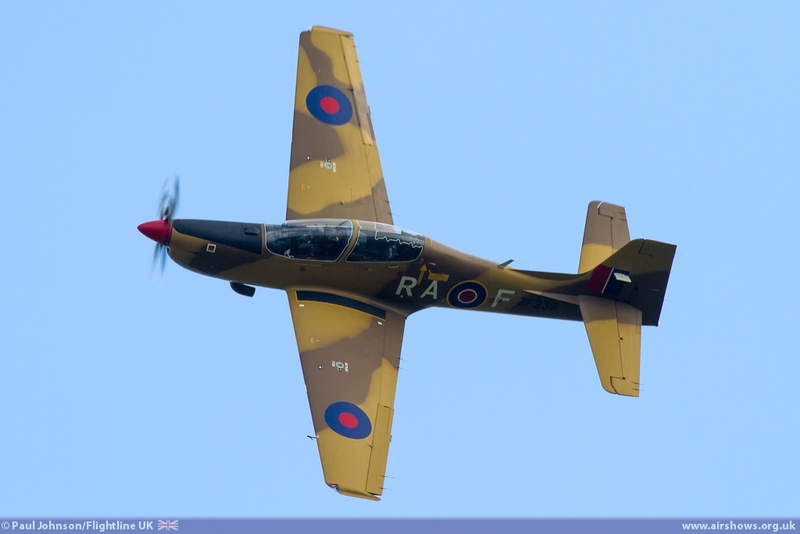 Over the winter the team has returned to its bright orange colours for 2013 sports some attractive and very patriotic Union flag branding on the wings. 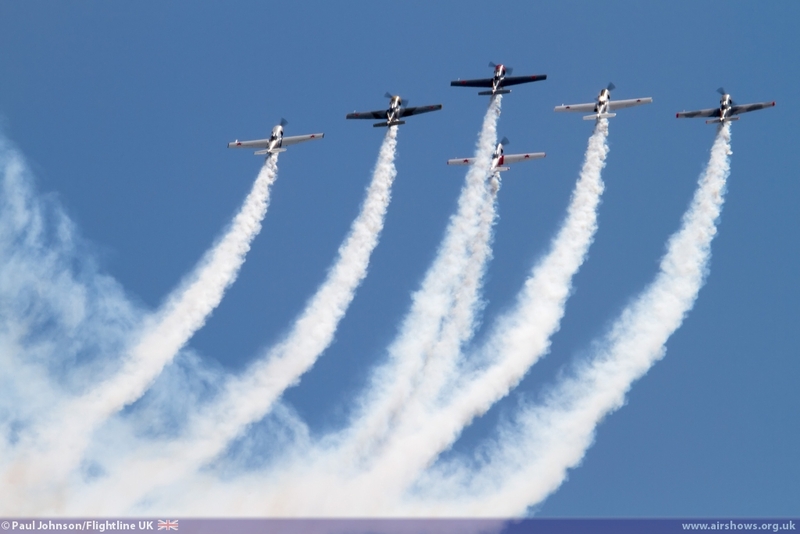 As ever their display was a masterclass of precision formations and aerobatics providing a fitting conclusion to a great display. 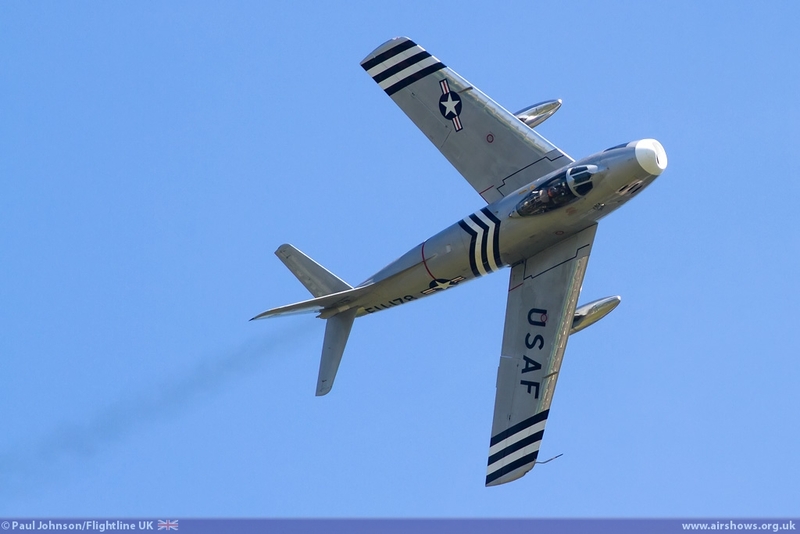 We cannot close this review without mentioning the significant traffic problems Cosford experienced throughout the day. 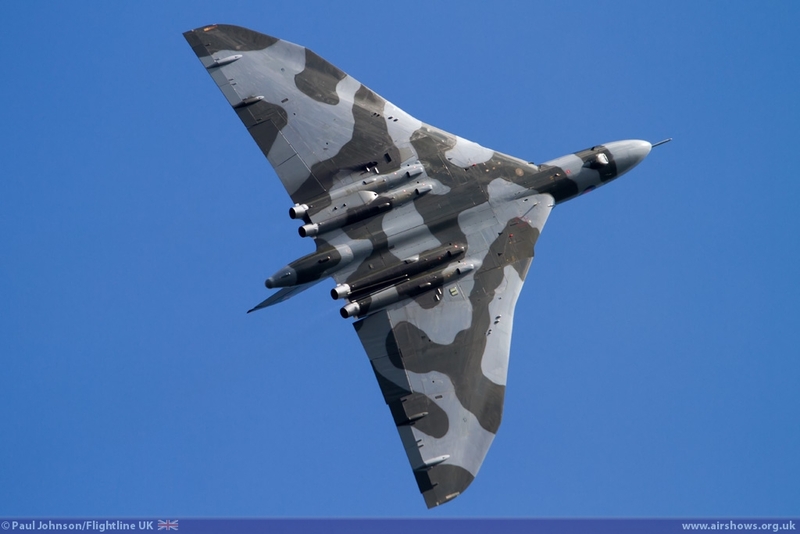 During the week before the show, advanced tickets proved to be exceptionally high which is most likely due to the superb and very settled weather the UK experienced in the weeks before the show and the great line-up. The show advised those with advance tickets to arrive early in a pre-show media release and it was certainly the case that lots of people arrived very early. I arrived much earlier than usual to be greeted by traffic already backing up to the main road outside the base. 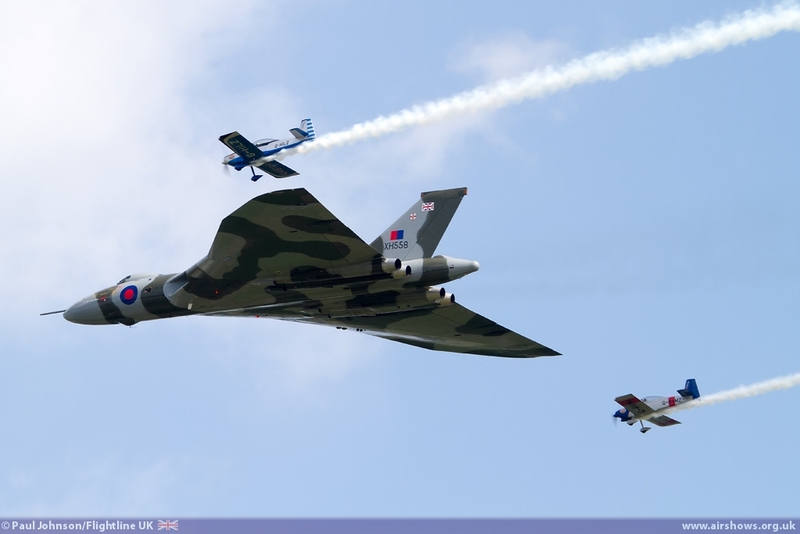 The gates were opened early to relieve this congestion but it clearly came apparent that Cosford was due a really massive crowd way in excess of 50,000. 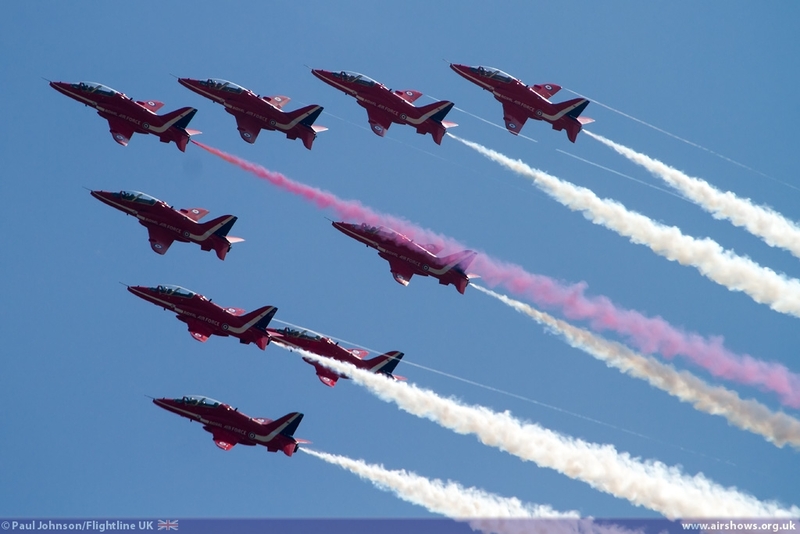 The show were quick to use social media and local radio to advise those who had not yet set off and hadn't already bought tickets not to travel to try and reduce the traffic problems but there were reports of queues of six miles or so backed up on the M54! 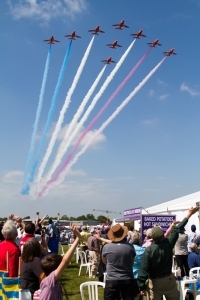 It must have been very frustrating to those caught up in the traffic problems, but Cosford is not the first show to experience such problems and certainly the organisers will learn some lessons from the day. 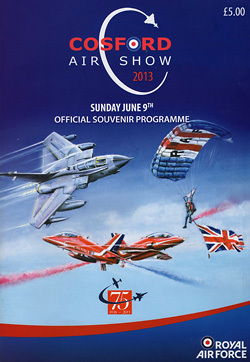 I really hope this doesn't put people off the RAF Cosford Air Show as it is always a really good show! 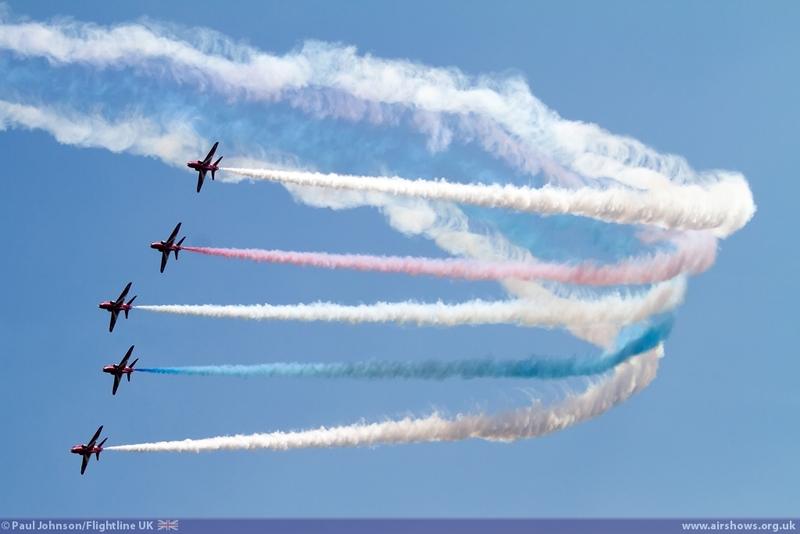 Bill Hartree and the rest of the Cosford Air Show team must be congratulated for bring together a very entertaining day both in the air and on the ground with plenty to see and do. 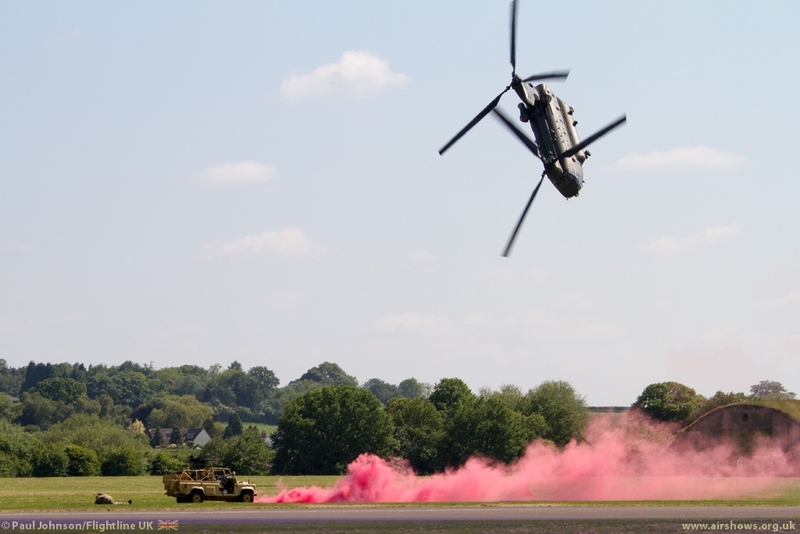 Also, praise must go to the Chinook, Apache and RAF Regiment personnel involved in the MERT demonstration and also Sean Maffett for putting together a great commentary for the scenario. 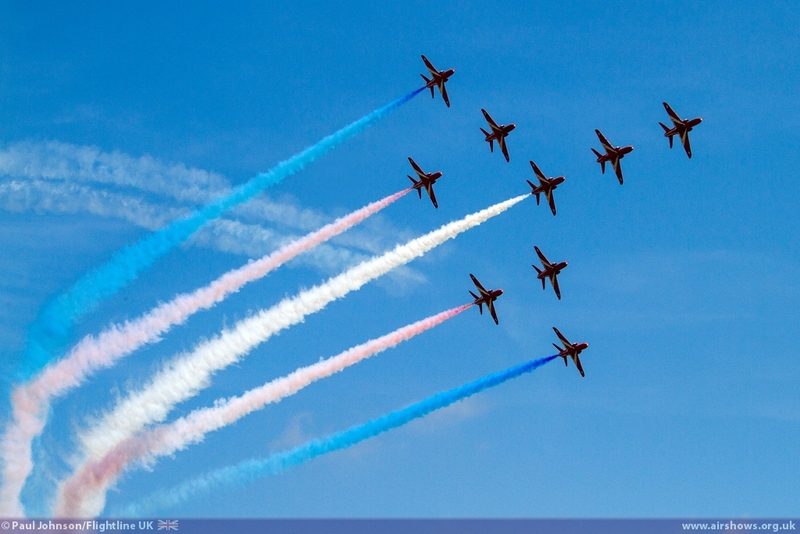 Cosford Air Show returns on the 8th June 2014 – we cannot wait.